A pile of typical screens. These screens are from our time playing the older White Wolf systems and were favorites for years. Like a curtain in a good theater, a well-used gaming screen hides the mechanics and provides a backdrop from which which the performance springs. Also like a curtain, they must not be a wall the performers hide behind when the going gets tough. From behind the game master’s screen wonders and horrors of every kind are revealed, from the terrible monsters lurking in dank dungeons to the wondrous prizes that await us at the end of our quest. As with any curtain, they should be pulled aside during play, kept just out of sight to hide the mechanical workings of the game and enhance the action on stage. 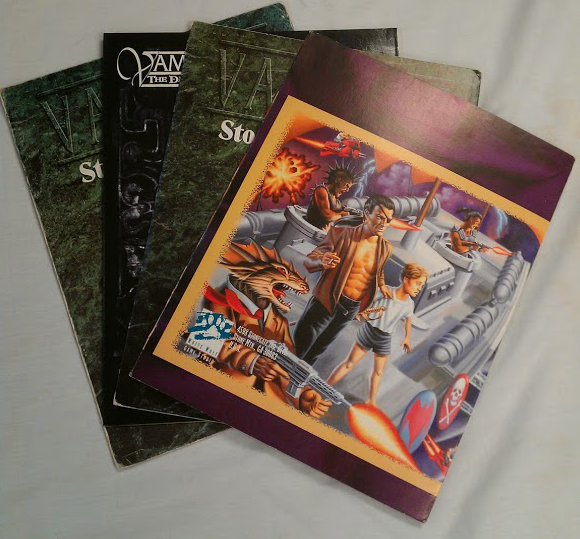 But the standard screens that come with most Game Master Handbooks are simply too big, seemingly designed to hide the game master as much his tools. So let’s get rid of them! A comparison of the two screens. You can see I used the White Wolf screen as my guide for width and shortened it considerably. As a game master, you should think of yourself, at least in part, as a performer on a stage. Have you ever been to a theater (live action or movie) where the curtain blocked the view of the performers on the stage during the production? What about a play without a curtain – where all of the scenery and wardrobe changes were visible and the behind-the-scenes was visible to the whole audience? I’d venture to say that if you have, that curtain (or that theater!) did not last very long. Most commercial screens are 11 inches tall or more, usually folding down to a standard 8 1/2 x 11 sheet to fit into a folder. While that leaves a lot of real estate for charts and figures, it presents a fairly imposing curtain that can block the stage from view. The picture above, while a bit dramatized for effect, is not that far off from the typical view of players sitting down to play with their game master. Placing this huge barrier in front of themselves, game masters believe they are hiding important game information when really they’re distancing themselves further from their players and robbing them of a clear view of the performance unfolding in front of them. 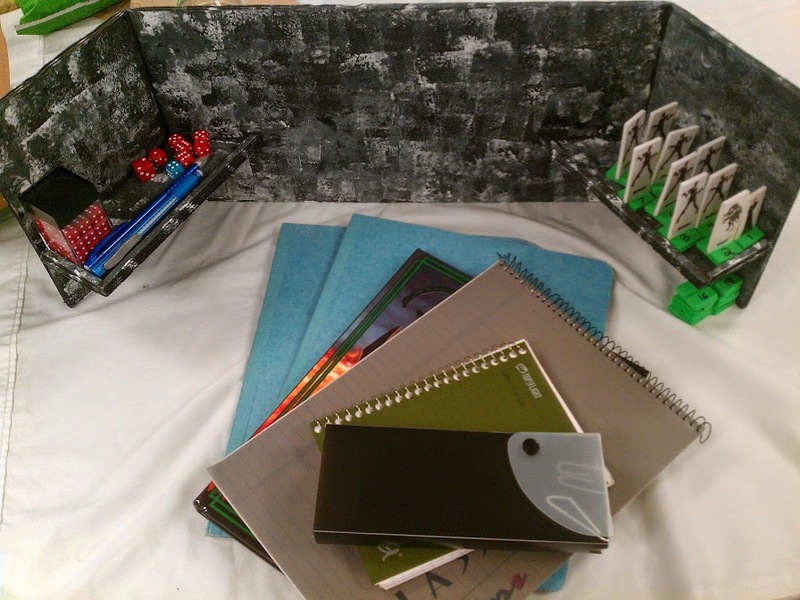 Some game masters try to hide the mechanics of the game behind large stiff binders or folders standing up on end to form a make-shift wall. Sitting behind this tall barricade always brought to my mind the French Taunting scene from everyone’s favorite depiction of King Arthur’s quest for the Holy Grail; an armored Frenchman shouting “Now go away or I shall taunt you for a second time!” from atop a lofty wall. When I shrank down the barrier and simply lowered the height of the screen, it was amazing to me how much better connected I felt to the table! By lowering the height it made me feel more like I was just having a conversation with the players (the audience, in our curtain example) and less like I was lecturing from behind a lofty podium. I was able to lean in close to impart secrets or convey my mood in body language or posture in ways that I couldn’t peeking over the top of a paper wall. But as the game master, unless you have helpers, you are also the director and the stage crew! And taken too small, the curtain won’t cover the necessary wires. Like a certain wizard shouting “Pay no attention to the man behind the curtain!” the secrets of your game are out there and exposed. The screen must cover the important behind-the-scenes aspects until they are ready to be revealed. You must strike a balance between uncovering your stage and hiding your secrets – and only you can determine what size is right for your game! As the Game Master you should have control over your table. With the screen directly in front of you, you cannot reach your tiles to adjust them or look your players in the eye. Obviously, you cannot completely control what the players bring to the table, and they should be free to arrange their things on it however they please. But when you arrive prepared before your players get there you should have time to arrange the table to your liking, including setting up your screen and the items behind it. Like the curtain during the performance, the screen should be off to the side where it will be accessible but not obstructing the view of the performance for anyone at the table. In the picture above, the area in gray shows where the game master would sit in relation to the screen, with clear and easy access to the map tiles (or game mat, if that’s what you use) in the center of the table and unobstructed view of the players. On smaller tables – or with bigger groups – you can even setup small folding tables off to the side just for the screen and dice to free up space at the table. Do not hesitate to move the screen during play, either. If you’ve made your own, make it stable enough to move with one hand. You can place it between the players and the tiles while you’re arranging the map or when placing monsters on it, or slide it more directly in front of you while you consult your notes or write down some game-specific information they shouldn’t see. I have even used the screen to partition off another player when I need to have a “private” conversation with them at the table. But when the performance is on, the curtain must move aside again so the actors (you) can take the stage once more! Behind the screen. There should be upcoming miniatures (top right on the shelf), game notes in folders and tablets (center), recent dice rolls and dice to roll (left shelf). Especially as technology creeps ever more into tabletop gaming, the amount of clutter at the game table is growing. A game master’s side of the table has a tendency to be the busiest area – with maps, dice, miniatures, rule books, unused tiles, markers, the night’s notes, NPC character sheets and now cell phones, tablet PC’s and laptops, the pile in front of us can get overwhelming quickly. It is tempting to hide everything behind a big paper screen – to shut the curtain tight and just press a few actors and key bits of scenery out into the center of the spotlight! Everything in play, including the game master themselves, should be out from behind the screen to give the players a clear view. This not only reduces cluttered feeling at the table, but gives clear lines of communication (outlined in green in the screenshot above) between all participants at the table which will better foster collaboration and engagement from the players while keeping the game master on task! What you arrange behind the screen is up to your preference. I like to roll things like initiative and damage rolls back there and keep any maps or props that I’ve brought for the game out of sight until the right time. I also arrange my monster miniatures back there so the players don’t know what to expect until it is unleashed! Whatever is back there, make sure it isn’t you. As I said above, you should be making eye contact with your players and keeping a clear line of sight to each of them throughout the game. In this way you’ll all be better engaged when describing the scene and you’ll be better able to include subtle body language or nuances of hand gestures to heighten NPC interactions. A note on rolling behind the screen: For non-critical rolls like initiative or damage reduction, rolling behind the screen prevents the game from devolving into a fancy arithmetic word problem (if two goblins leave Korrigan traveling at 1km/hr how many hitpoints does a Ogre have in Merrihill?). But for key rolls – the soak roll for the killing blow against the big boss, or the bargain roll for the big piece of gear the players have been after, consider rolling it where the players can see! It gives transparency so the players know you’re just as much a victim of the dice as they are, and adds a bit more suspense to the moment as the dice clatter over the table! We learned a lot by making our own screen and shrinking it down. I really feel it has improved game play in a short period of time! So consider shrinking it down, moving it aside, and changing the way you use your screens! If you liked this article, please consider following the Thirdwalling blog. Followers let us know that you appreciate our content and encourage us to do more! If you have questions or opinions, take them to the comments section! Your questions help us make future articles better! Special thanks this week to Expletive Deleted for taking many of the pictures in this article. The good ones were all hers! 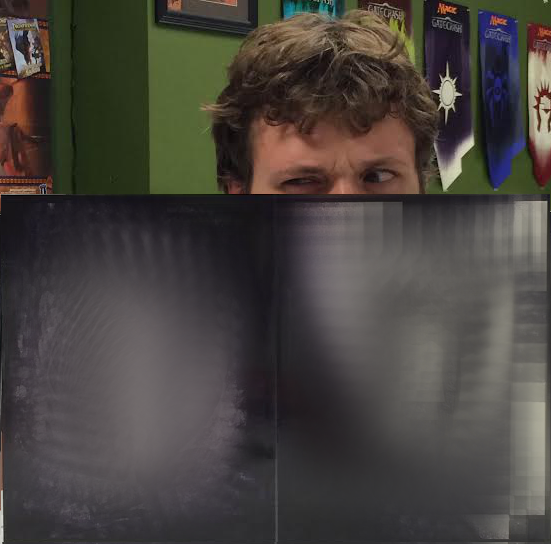 An astute observer on Facebook pointed out that the DM screen in the featured image is either comically large or the guy behind it is ducking down. In truth, the answer is “A little of both”. We dramatized the image a bit to drive the point home. The screen is the tallest one I have (14″, I won’t name the system for the same reasons I blurred the screen) and Leg Up is 1/4 sasquach so making him stoop down isn’t unheard of in pictures. Expletive Deleted did a great job of using some forced perspective to make the screen look more imposing, and I thank her for that. I think it does a great job of conveying the point I was trying to make. She’s awesome!